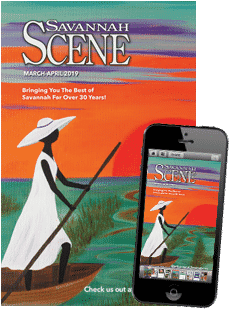 As you might have guessed from our previous posts on Federal and Italianate styles, Savannah is no stranger to diverse architecture. 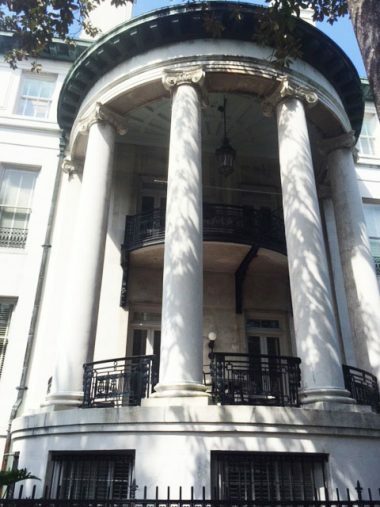 This time around we’re highlighting Greek Revival architecture, which was another movement that influenced a number of buildings in Savannah’s Historic District. Greek Revival architecture dominated the U.S. during the late 18th and early 19th centuries, especially throughout the South. During this time of growth and development in the United States, the country’s founders looked to ancient Greece for inspiration in forging their own path. In terms of architecture and design, this meant adopting those iconic columns and scrolled volutes, among other key characteristics. Doric orders are simple in structure and often placed close together. This simplicity makes them the most common columns seen in Greek Revival architecture. And because of the large size and lack of ornamentation, Doric often gives off a sense of safety and security. Ionic orders are easy to spot because of the scrolled volutes atop the columns. Gabled porticos are the arched, sometimes pointed, roofs above a front porch door. Popular throughout the residential south, they’re often paired with two skinny columns framing the entry door. Ancient Greek buildings were made with heavy stone. In the United States, however, buildings were crafted in wood and then painted with white plaster to give the appearance of stone. Greek Revival buildings commonly have sloped roofs because of the simple facade outline they create. Cornices, the molding underneath the roof, give the building a decorative flair. 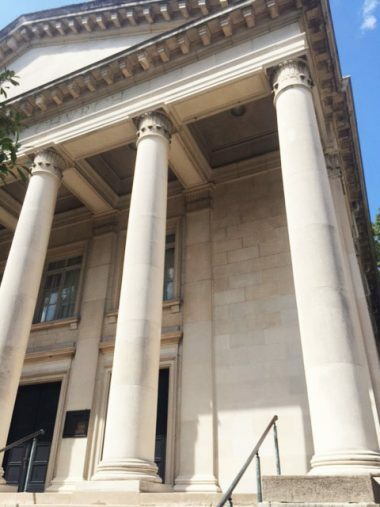 You can find a few Greek Revival beauties spread out around the Historic District. 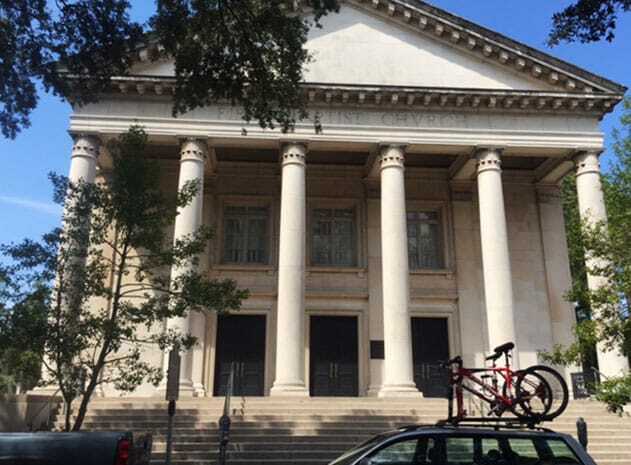 The First Baptist Church, located on Bull Street, has the ancient Greek temple facade and rare Corinthian-style columns. Over on Chippewa Square, the Philbrick-Eastman House also features massive columns on a half-circle portico. And the Harper Fowlkes House features grey brick resembling stone, as well as intricate details on the parapet.